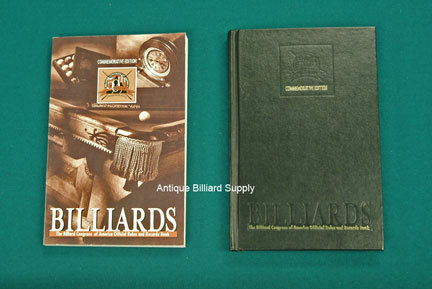 #12-06 Commemorative rulebook issued by the Billiard Congress of America in 1998 in observance of their 50th year. A must-have for the serious billiard enthusiast, this work includes rules for most popular billiards games, guidance for referees and instructional tips for beginning players. Winners of all past championships are listed, along with world record holders and biographies of Hall of Fame members. A total of 240 pages, about 5 inches wide and 8 inches tall. Soft-cover version (left) $40, special edition with embossed hard cover and gold leaf lettering (right) $250.